As we head into the final week of Community Read, the enthusiasm and open-mindedness people are showing during the discussions and programs are inspiring. We hope everyone in Charlotte will be touched in some way by Community Read. With only eight days left, there is still time for you to make an impact. There are more programs and events scheduled at Library locations and with community partners. So, what’s the newest buzz with Community Read since last week? The lineup of events was truly amazing with intense and inspiring moments. 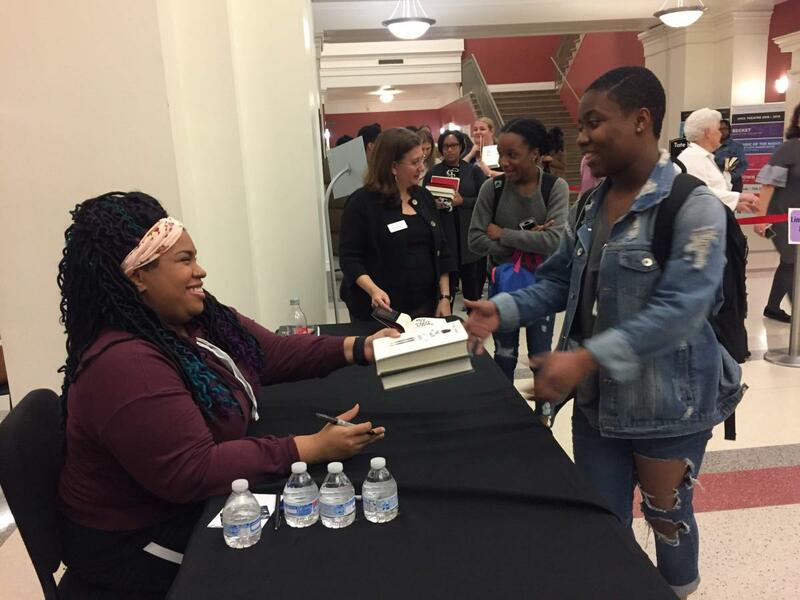 Week 3 kicked it up another notch when famed author Angie Thomas inspired more than 600 guests to find their voices and pursue their inner activism during her appearance at the Dale F. Halton Theater at Central Piedmont Community College on March 19, 2019. A diverse group came prepared with questions for Angie Thomas and her book, The Hate U Give. The energy in the room was electrifying and afterwards, fans lined up to have their books signed and photos taken with Angie. The major takeaway from the evening was that “empathy is the key [to fighting] equality and equity.” Erika Dunlap from sponsor Bank of America opened the evening and Chief Kerr Putney of CMPD provided closing remarks. Also, supporting sponsors Foundation for the Carolinas and the Charlotte Mecklenburg Library Foundation were in attendance with other community partners. It was an inspirational evening! The discussion continued with WSOC-TV when the station highlighted the upcoming visit of children's book author Matt de la Peña to discuss his Community Read title Love. This event is scheduled for March 28, 2019 at 7:00 p.m. at ImaginOn: The Joe & Joan Martin Center, The Wells Fargo Playhouse. He will also make a special appearance earlier that day at the StoryWalk in Seversville Park where his book is featured. Don’t miss out on the discussions and programs during this final week of Community Read 2019. Pledge online to participate, attend a program and let your voice be heard. For the next few days only, download an audiobook or e-book of The Hate U Give for no-wait during the remainder of March. Find a complete calendar listing here. Community Read 2019 is not over yet. There are still books to read, events to attend and more opportunities to get inspired and make an impact in your community.